In past posts, I talked about establishing emotional connections between readers and your characters. Today I am adding a new method – accusing your character of some kind of wrongdoing or fault and later vindicating him. When a character is falsely or unfairly accused, readers often feel righteous anger at the accuser and sympathy for the accused. Readers want to see the accused character vindicated. When the writer delivers that vindication, readers feel relieved, and the emotional satisfaction the device creates is powerful. A long-lasting accusation in which the vindication waits until the end of the story. If the accusation lasts a long time, give the character an ally who believes in him. It can be even better if the ally comes to the accused’s side because of the accusation, that is, this is a new ally. And if the new ally takes a risk by taking the side of the accused, the effect is even more powerful. When the accused has no allies, readers can feel a sense of hopelessness. Providing an unexpected ally alleviates that feeling without taking away the tension. Expanding on #3, a writer can abuse this device by showing everyone agreeing with the accuser, thereby isolating the character. Writers probably think isolation will provoke even more sympathy. In reality, this isolation can harm the story by stretching the device beyond reasonable limits. Why? Because readers know the accusation is unfair and think, “Why doesn’t anyone else see that?” Such unanimity among the accusers can make readers uncomfortable and suspicious of the storytelling. Readers can feel their emotions being abused. The heroic character needs to be vindicated by at least one important side character as soon as possible, someone who is not yet an ally of the hero and who might side with the hero over this accusation. This will relieve the sense of disbelief and provide a character readers can focus on as the carrier of their emotional burden for the hero. Following are two video clips from the TV show “Prison Break” that provide a simple, small-scale example of this device. In order to understand it, I need to provide some background. The first scene is in a prison in Panama. Our heroic character, Michael Scofield (the guy with the buzz cut and intense eyes), is trying to break a man named Whistler (the guy who is bleeding) out of this prison. In fact, that is the reason Michael is there. He has committed no crime. They are in an underground tunnel and are trying to dig their way upward to freedom. Michael’s enemy, Sammy, interferes and tries to take over the operation. The upward, vertical tunnel is fragile. Michael, being a brilliant structural engineer, knew exactly where to place a short piece of rebar to stabilize the supporting framework. When Sammy goes up into the tunnel, Michael watches intently, knowing how fragile everything is. Now watch the short clip. Since Sammy is now dead, they have the freedom to continue trying to dig out, but the collapse badly hurt their schedule. In the next clip, you will see Whistler making an accusation against Michael by questioning whether or not he is a real engineer. This accusation is unfair. Michael knows it’s unfair, but he won’t defend himself, because he is ashamed of being the reason for Sammy’s death. He is not a killer, and he despises killing. A flashback (tinted blue) shows that Michael, knowing Sammy was coming, intentionally removed the rebar before Sammy arrived. The other man in the scene is Alex, a man who was Michael’s mortal enemy for a long time. They are still not friends, but he becomes the vindicator. Now watch the scene, and I will continue the discussion. Michael’s shame prevented him from defending himself, a good choice by the writers. It is far better for the hero to gain vindication from someone other than himself. When Michael thought he was alone, he brought the rebar piece into the open. Alex returned and saw it, then noted that “it never gets any easier.” Easier to what? To kill someone. Long-time viewers of the series would know what he meant, because Alex has killed many times and has remarked on Michael’s unwillingness to kill even if not killing might cost him his life. In any case, Alex realized what Michael did, that Michael planned the collapse, killed Sammy, and saved the escape plan. Michael was, indeed, a skilled engineer. Alex vindicated him. The device also brought out significant character qualities in the heroic character. Which would he choose, to let his accuser know that he planned the death of their adversary, thereby painting himself as someone who is casual about the sacredness of life, or would he allow the accusation to fall on his shoulders unchallenged and accept the damage to his intellectual reputation? Viewers, therefore, want Michael’s reputation vindicated. The tension increased their emotional dissatisfaction with the situation and also increased their positive connection with Michael. Then the vindication relieved the dissatisfaction, and the positive connection stayed in place, because Michael was steadfast in refusing to defend himself. I think the writers did an excellent job with this accusation/vindication sequence. Yes, this is very, very true, even from my own experiences. And if written right, the falsely accused thing can be downright traumatic and maddening for the character and give them a lot of room to grow throughout the story. One thing to note is that the character doesn’t have to be directly accused by another person. The character can feel accused because the circumstances make them feel responsible, or perhaps the character accuses himself/doesn’t know who to blame. 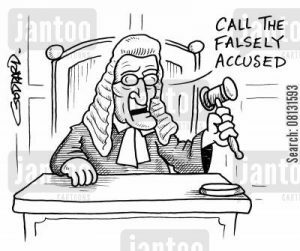 I’ve noticed that stories often explore the idea of someone being falsely accused and either feeling guilty, or just trying to clear their name. One thing I don’t see very often is a character being falsely accused, knowing how wrong the accusation is, and having much of their turmoil stem from anger and defiance at the false accusation. If a character is wise and confident enough to know when something is not their fault, it can be very difficult for them to work through the anger that they may feel when they know society expects them to feel pain and guilt over something that wasn’t their fault at all. I would also argue that although it is often good to give the character an ally that believes them or at least wants to give them the benefit of the doubt, there are also times when the ally character should come in late, or not at all. Sometimes people have no choice but to work through things themselves(or by themselves and with God) and such stories can help people know what it’s like to work through something even without a human ally. From my own experiences, there have been times where I feel like I have been in unfair situations without allies(or at least not any that can help me or give me the answers I need) and yes, it does feel very hopeless. But working through that on my own and learning that I can figure out how to be happy even if the world hates me has been one of the most empowering experiences I have ever had. I know to still accept help from others when I need it, but I am a million times healthier knowing that I can be ok even when left to solve issues on my own. If the character doesn’t have an ally, one can help the reader get through the hopelessness and onto the victory by helping the reader slowly realize that the character has things at their disposal to help fix the situation. Many of my characters are assassins, for instance, and tend to have some idea of how harrowing life is, and therefore it is easy to give indications that as soon as they’re done reeling from the bad situation they’ve found themselves in, they will be able to find some solution eventually, even if the process is painful and uncertain.. While it is true that reality sometimes poses situations in which you will not have an ally at all, in storytelling, a character having no allies when unjustly accused carries a risk, as I stated in the post. It’s up to you as a writer whether or not you want to take that risk. Wonderful advice! I haven’t thought this over that deeply, but now I can see how it plays out in stories I’ve read, watched, and written. What would you say when the accused and the accuser are the same person–as in, when a character heaps undue amounts of guilt on herself? The reader’s anger (toward the accuser) and sympathy (toward the accused) will be directed at the same person. Is that problematic? And would an ally still work the way you talked about? That’s hard for me to answer, because my own reaction might not be the majority, but I get frustrated with people who heap guilt on themselves. I realize it happens in reality, so I do have characters who have done it, but I always bring in another character who tells the guilt-ridden one to cut it out. Therefore, since I have so little sympathy for those who accuse themselves when they should know better, my emotional-connection solution is to provide a character who does what I would do in that situation. As she closed her eyes and took on Tibalt’s pose, a hundred thoughts raced through her mind. The most painful one? Shame. Again that school lashed her with its sharp whip. All this time she had fretted about not being in control and wasting precious minutes, when the option to pray had never crossed her mind. Elyssa scanned the sky, squinting in the midday sunlight. The voice was audible, not something in her mind. Had the Creator decided to respond in a new way? She had never heard such a clear voice before, and this one was feminine. If the Creator was really female, that would be a shock to the clergy back home. Thanks for the input! Oh, I remember that scene from Diviner. It really touched me, because *I* often struggle to release the whip. In one of my stories, a character with a “whip problem” finally changes her beliefs in the end, in part because of another character’s steady, loving actions. I agree with Mr. Davis, it is very frustrating when characters and people heap undue guilt on themselves and it helps to have another character come in to give the guilty one a reality check. Personally, I think in stories the undue guilt tends to be frustrating because writers don’t really have the characters feeling guilty for legitimate reasons. An example of how to handle undue guilt well is in the Lion King. Scar made Mufasa’s death look like an accident and guilt tripped Simba by basically saying ‘It’s your fault because he wouldn’t have died if he hadn’t tried to save you.’ While it should be obvious that it wasn’t Simba’s fault, it makes sense that Simba feels like it was, since he was young, impressionable, and had no one else to blame at first since the whole thing looked like an accident. And Scar used that to his advantage. I agree. When Simba believed Scar’s accusation, I rolled my eyes, and the frustration of Simba believing the silly accusation for such a long period of time was one of the few negatives of the film (I loved the film as a whole). It felt like a contrived device to get Simba to leave. The writers were too lazy to come up with a better way to do it. Of course, someone came later and told Simba the accusation wasn’t true, but it came far too late. I couldn’t suspend my disbelief that Simba would be that gullible and/or foolish. If he was so foolish, then he didn’t deserve to be king. Yet, as I mentioned before, my perspective on this might not be a majority one. Yeah. I really had mixed feelings when it came to Simba. It isn’t within my personality to feel guilty for something I didn’t do, so I couldn’t help but think ‘Simba, how could you possibly think this is your fault?!’. But then, I dunno. Putting myself in his shoes I sort of do get it, because a little kid is less likely to be able to sort that out on their own(since they are sort of used to feeling guilty about whatever adults tell them to feel guilty about), and Simba didn’t have anything else to blame(he pretty much stops blaming himself when he learns Scar killed Mufasa), so I feel like it makes sense in context of the film. That means it’s still frustrating to me, just not in the ‘this film doesn’t make any sense’ way. But I’ve seen so many other shows where something is clearly not a character’s fault(to the point that I can’t even figure out why the character would feel guilty) and the writers are clearly having the characters feel guilty just to add drama. I really, really hate that. I could see Simba feeling that way when he was so young, but not later when he had grown up a bit and had time to think about it. The only reason the writers had for the accusation was to get Simba to go away. There were better options. Maybe Scar could threaten the life of Simba’s friend or his mother. Even if it revealed Scar’s evil, it would be more believable. Yes, it would endanger Scar later when Simba grew old enough to return and fight, but the same could be said for the accusation. It was a fragile accusation at best, one that Simba should have figured out to be a lie. 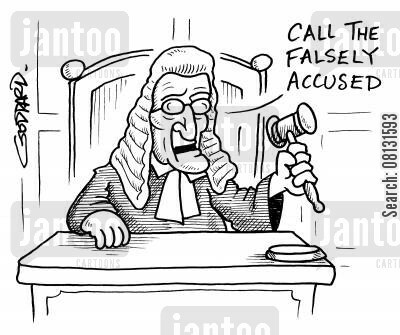 I think it’s better for false accusations to be false in the mind of the accused and to allow for at least one character to side with the accused. As the video clips demonstrated, it can be powerful. The ally doesn’t have to come right away. A writer can allow some frustration in readers as they hope for an ally to come. When the ally finally does come, it can be a great emotional relief. Yeah. The only thing is that I don’t think it would make sense for Scar to do something that would blatantly show that he killed Mufasa on purpose. It wouldn’t be within his personality. Plus, he kinda sent the hyenas to kill Simba right afterward, so it wasn’t meant to be a long term trick. When he guilt tripped Simba, I think he was partially just being cruel, and partially trying to get Simba to run out a ways, that way it would look like the hyenas stumbled upon him and decided to kill him. That way, Scar could go back to Pride Rock without carrying the scent of Simba’s blood. Then, he could always blame the hyenas for Simba’s death, assuming anyone figured out Simba wasn’t stomped to death by the wildebeasts. The reason the guilt trip worked for so long was because the ‘I’m guilty’ narrative was all Simna could tell himself for years, since he never confided in Timon and Pumba. If he had, then they could have helped him realize he wasn’t to blame. When someone has had a toxic narrative in their life for years, it can be difficult to overcome completely, even when the person finally knows the truth. That said, it would have been fascinating to see Simba realize his innocence sooner and then still have another reason for wanting to stay away(Pride Rock holding too many memories of his father, maybe?) Or, at the very least, showing more of why he felt guilty. It would have helped if he reflected more on the trouble he got into with the hyenas and compared it to the stampede, and then he realized how much his reckless fun ALWAYS put him, Nala, and Mufasa in danger. Then, the guilt wouldn’t have been ‘I killed my father.’ it would have been ‘I was always so carelessly putting others in danger, I’m such an idiot, I don’t deserve to be king’. One theory I have when it comes to unnecessary guilt is that it is supposed to make a character look more kind, sympathetic and overall GOOD. Even though it may frustrate us to watch a character heap guilt on themselves, it shows that they care deeply about others and are willing to take responsibility. A character who bluntly refuses to accept guilt would be less sympathetic, even if they weren’t actually responsible for committing wrongs, because someone refusing to feel guilt can look like an angry and unsympathetic person. That’s been kind of a hard thing for me to swallow, because that seems to carry over into real life, too. People tend to blame the parents of a school shooter just as much as the school shooters themselves, for instance. And then the parent has to show remorse and guilt regardless if they actually did anything to influence the school shooting, else they look like a bad person. So as annoying as it is to watch chars feel undue guilt, I think all that is one reason why they are written to feel so much guilt. So…yeah, I dunno. I think over the years I’ve felt frustrated with Simba’s guilt, but have decided it somewhat makes sense for his character, though it could have been handled better. My biggest pet peeve in all this is when the guilt is pretty much just there for drama/to make the guilty person look nice and caring without there being any sort of reason for them to feel guilty. Other than that, if there is a legitimate reason for a character to feel undue guilt, I feel frustrated yet understand why they feel that way. What’s your opinion on the character feeling guilty when they actually did do something wrong? Is it fine for you as long as the story doesn’t harp on the guilt too long, or do you feel like the character should be free to experience guilt so long as they actually did something wrong? I forgot that Scar sent the hyenas to kill Simba. Good point. Yet, as you mentioned, it doesn’t affect the fact that Simba continued carrying guilt without cause. I think you’re right that accepting guilt when not guilty can make a person seem good and noble in the eyes of some, maybe even in the eyes of the majority. I am not one of those who think that way. If a person is guilty, then accept the guilt, make amends in the best way possible, and move on. If a person is not guilty, then accepting guilt is just a lie. It doesn’t make a person more sympathetic in my eyes. It just means he or she is willing to accept a falsehood and its associate lashes in order to appear saintly to society. I find that to be repugnant. But, again, I am probably in the minority. In storytelling, it’s fine for a guilty person to feel guilty. It can make an excellent story, especially when the character is desperately seeking redemption, such as in Les Miserables. Yeah. To an extent their willingness to make accept undue guilt makes them look kinder to me, but at the same time it makes me ill because it is so painful to watch. I like seeing it addressed in a story, because it is a major societal issue that needs to be addressed, but stories usually don’t address it and just have the character feel undue guilt for no reason, and those stories might even act like it is good for the person to feel undue guilt. And while I don’t mind watching characters struggle with guilt for long periods in a story, I agree with you from the standpoint that I prefer it when stories show that a character needs to eventually move on from the guilt and do something productive with their lives. As a side note, one way I handle guilt, especially unnecessary guilt, is to have the character partially realize they aren’t ENTIRELY to blame, or to at least question if they are entirely to blame. Sometimes it also helps to make it complicated as to whether the character is truly at fault. I’ve actually been thinking through this lately since I’ve resumed working on my Naruto fanfiction. In the Naruto anime, a character named Itachi kills his entire clan in order to save his younger brother and his village. Itachi didn’t want to kill his clan, and went through a lot of guilt and turmoil before he finally goes through with the massacre. The only reason he did it was because his clan was plotting to take over the village, which would start a civil war and perhaps even a world war. The leadership of the clan and the leadership of the village weren’t willing to back down at that point, so Itachi agrees to kill the clan as long as he is allowed to spare his little brother, because he decides that killing the clan is the only way he can minimize the damage this whole mess is causing. He knows if he doesn’t kill the clan, the clan might die anyway in the resulting civil war, or the village itself could be destroyed in the battle. In the fanfiction I am writing, I kind of explore a lot of his turmoil and how it affects his life afterwards. One thing I do is have him feel an extreme amount of guilt for killing his clan, but he still feels very angry because he knows he isn’t the only one to blame. He resents his parents and clan for wanting to take over the village, because if it wasn’t for their ambitions, he wouldn’t have been forced to destroy the clan in the first place. Struggling with guilt, that is, wondering how much you might be to blame, is certainly realistic and worth exploring. It’s not the same as accepting blame when it doesn’t exist. Real struggle often happens when we face a dilemma and truly don’t know what to do. We might try one option, and it ends in failure and someone getting hurt. Of course we did not intend for that person to get hurt, but it did happen because of our decision. Such a scenario can lead to self doubt and wondering if real guilt is appropriate. Second guessing is a part of life. I like a story that explores that but not if the character never comes to a decision, that is, wallows in the mire of self-doubt and guilt. I want a character to decide if blame if reasonable, then act accordingly. Such a decision doesn’t have to come in an instant, but it’s healthy and appropriate to finally do so. And reading about characters who do that can be helpful to readers. Yeah. The way I approach it in this particular fanfic is to have Itachi struggle with it for years, but mainly since the situation was extremely complicated and had an extreme amount of repercussions that lasted for years. So really, instead of just working through guilt over the massacre, he is also slowly working through every issue that came out of it. In the anime, Itachi kept his reasons for committing the massacre a secret and leaves the village, causing his brother to seek vengeance on Itachi. My fanfiction is different in that Itachi hides the fact that he committed the massacre and stays in the village to raise his younger brother(Sasuke). In my fanfiction, Sasuke still goes on a path of vengeance when he learns his brother was behind the massacre. So Itachi feels guilt and turmoil for so long because consequences like that are constantly happening. The fanfiction is about his struggle to forgive himself or at least find some semblance of peace. One thing he eventually decides is that regardless of whether he should feel guilty or not, he has a lot of people that love and care about him, especially when he eventually has a family of his own. Because of that, he is determined to live a good life so that he can be there for and protect his loved ones. Partially because they want to see him happy, and partly to make up for the past. There are many avenues to explore. I meant for this post to look at false accusation and subsequent vindication, which is a narrow focus, yet still a powerful device. It might be helpful to widen the scope a bit in another post and examine true accusations and realistic blame along with dilemmas that can raise questions regarding whether or not a character’s actions are blameworthy. In either case, the character’s turmoil and actions to solve the problems can be intriguing and emotionally connective. For myself, however, I would avoid having a character wallow in self pity. I find that extremely off putting. Mr. D, sorry if my question derailed the focus of your post! It still offered me plenty of food for thought when it comes to real accusations and vindications–though I’d love to read a follow-up post as well. No worries. Related tangents are often great topics for discussion. Another example I can think of that uses that device is a scene in Narnia: Prince Caspian. (both the movie and book) Where Lucy sees Aslan, but no one believes her except for Edmund who (only in the movie) believed her. Until the vindication came and Lucy lead them to Aslan. This device is also shown in the first book with the scenario with Lucy telling everyone about the wardrobe. Yes, that’s a good example.